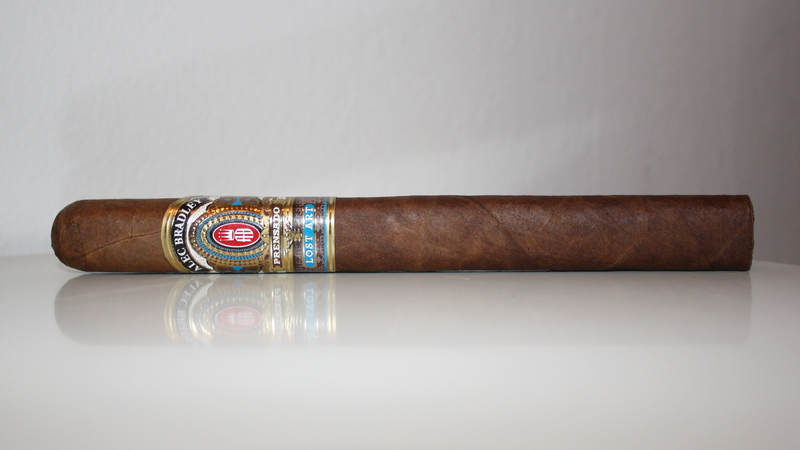 Few cigars are as widely recognized as the Alec Bradley Prensado. The original Alec Bradley Prensado Churchill won Cigar Aficionado’s coveted Cigar of the Year distinction in 2011, catapulting the brand into the national and international spotlight. Since then, the company has released a number of lines, including the Alec Bradley Mundial which is one of my all time favorite cigars (though I’ve noticed that opinion isn’t shared by many). 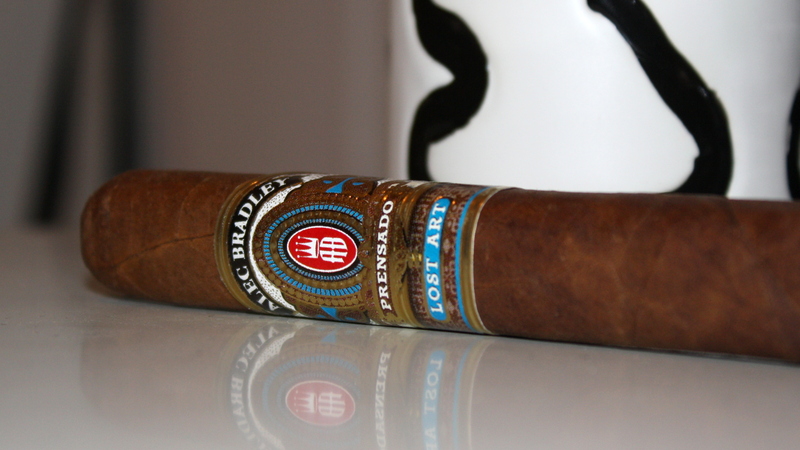 The Alec Bradley Prensado Lost Art has big shoes to fill. So let’s get on to the review, shall we? The Prensado Lost Art Churchill is semi box pressed, making it very comfortable to hold. There is a light springiness when I squeeze the cigar and I can tell it is packed very consistently. As for branding, it is special simply because it’s great to see an addition to the Prensado line. It may look like there are two bands on this cigar, but there really is just one. The pre light draw is moderately restrictive, and brings forth aromas of granola and coffee, very typical for Alec Bradley in my experience. Fans of the Prensado will have no difficulty in recognizing his blend when they first light up. I’m greeted by thick, robust flavors of earth, cedar, and espresso, all augmented with a saltiness that reminds me of salted popcorn. At the same there are hints of vanilla and cinnamon on the nose, making for enjoyable and complex start to this smoke. By an inch in the balance of the flavors has changed a few times, keeping me on my toes, which I love. The smoke is medium bodied and very smooth. Moving in to the second third, the earthiness and spice has drawn back, leaving the vanilla, cinnamon, espresso and popcorn saltiness in focus. Very, very good. There is also a new note, a kind of oatiness that complements the other flavors well. The burn up to this point has been fairly wavy, requiring some purging to correct. I’ve also noticed that the cigar can’t be set down for long before it goes out. This is significant because smoking a cigar too quickly can distort the flavors of any cigar, so it doesn’t weigh in this cigar’s favor. Entering the final third, the flavor increases significantly, adding strong, sweet natural tobacco note. To me, this is where Prensado Lost Art really catches its stride, with all flavors kicking in simultaneously in the final 20 minutes of the smoke. 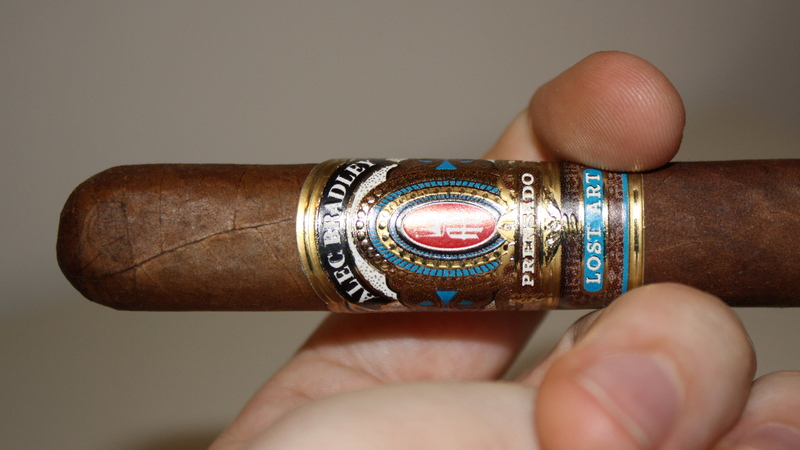 The Alec Bradley Prensado Lost Art is full of charisma and is, dare I say it, a bit of a show off. The flavors come and go, playing off of each other wonderfully, making this a worthy follow up to the original Prensado line. It bears many of the hallmarks of the original Prensado (earthiness and granola) while adding some additional complexity (vanilla, popcorn salt). I think it clocks in at a solid medium, and because it is so smooth, it will appeal to the new cigar smoker and the veteran alike. The only criticism I have is that the burn was never really straight, which could be a fluke or a direct result of the double binder. All of these considerations lead me to a rating of 93/100.